“Don’t blame it on the sunshine/ Don’t blame it on the moonlight/ Don’t blame it on the good times/ Blame it on the boogie”. Chris Mba was the Nigerian king of boogie in the 80s. Just like Dizzy K, he was heavily influenced by the King of Pop judging from the way he dressed, sang vocally and danced. Even with this, he stood out from the pack due to the songs he chose to sing – they were lyrically correct and refreshingly sounding. 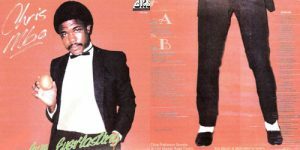 Signed by Chris Robins Sound (CRS), this Abia-State music star went ahead in 1983 to drop his debut album “Love Everlasting” to non-stop accolades. The album was Recorded and mixed locally at Rogers All Stars Recording Studio in Umuokpu, Akwa. His biggest single “Baby Don’t Cry” is still very popular till date and kids born in the 90s can sing it word for word. 80s Super Producer Jake Sollo helped to produce the track. The song is a definite party starter and will get to your feet. He went on to release 2 more LPs but this time with the label Polydor – “Take It To The Top” (1987) & “Hope” (1989). Today, he is believed to reside in a Low-income area in Surulere and not much is really known about him and his problematic knees. We can only pray that God has healed him and he can now support himself financially.